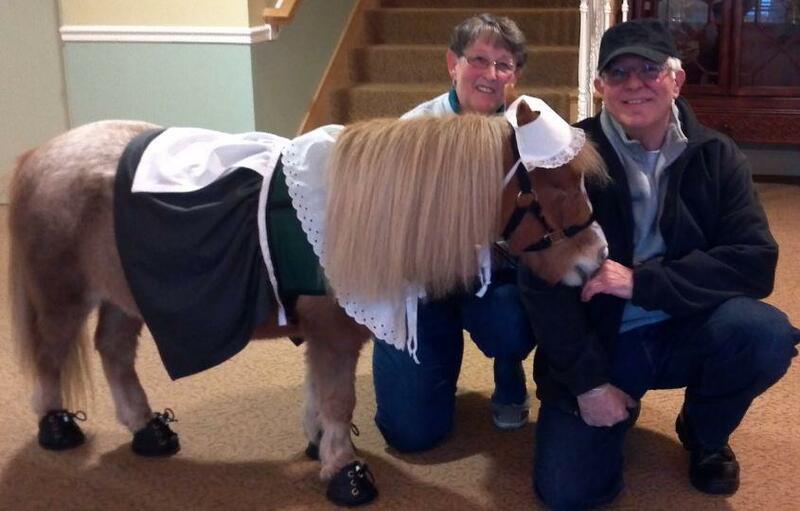 A huge congratulations to Marsha Craig and Lily, her miniature horse. The pair will be presented with the inaugural Nemo Award from the Tufts Paws for People organization. 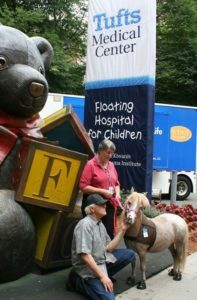 Along with Marsha’s partner, Jack Martin, the team works arduously and brings smiles to scores of patients in several New England facilities. We’re so fortunate to have several NickerNews pages dedicated to their work. Read more about them here. This year alone, the trio has worked an incredible 1,000 volunteer hours. 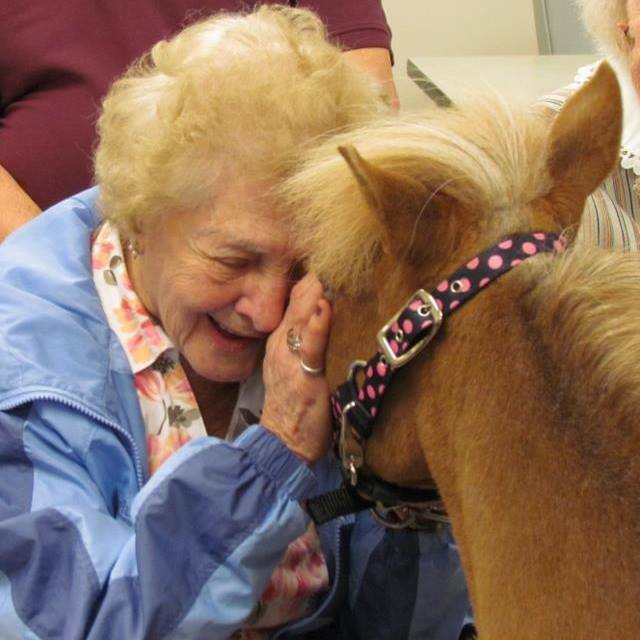 In addition to nursing home and hospital visits, they’ve participated in the comfort visit with the Boston Marathon bombing volunteers and first responders as well as visiting The American Red Cross Headquarters. “I have to say I’m honored and embarrassed at the same time!” said Craig. For years, we’ve done work at the Community Living Center, a rehabilitation, nursing home and hospice facility in Massachusetts. We visit there once a month and visit both floors. Room to room. Bed to bed. Some of these residents have been disfigured beyond imagination and the fact an animal doesn’t get repelled makes them so grateful. One gentleman had from his cheek to chin missing, talking near impossible. It was more like utterances. He tried to hide from us, but kept watching Lily. You could just tell he wanted to touch her in the worst way…As I walked up to him he started to hide, so I loudly said, “Hi there, this is Lily and she won’t leave unless you at least acknowledge her.” (And there is a great deal of truth to that as she loves to be adored.) He came to the doorway, making eye contact with me to see my reaction now that we were within feet of each other. He nodded and bent down. I asked if I could touch his forehead, he nodded. I touched where I wanted Lily to kiss him and without hesitation she gave him the gentlest kiss. He was overcome with emotion, crying, touched his heart and pointed to Lily, Jack then myself to say thank you from his heart. Our supervisor told us that he’d never left the confines of his bed before so this interaction was huge. 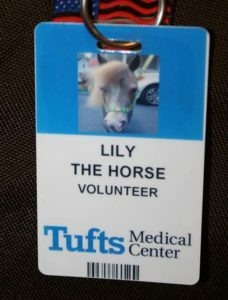 In 2011, we were asked to visit Tufts Medical Center and try the Adult Behavioral Unit. This trial visit became an every month visit and now also includes Cardiomyopathy and Pediatrics units. We also visit them every Easter Sunday and every Christmas Day. 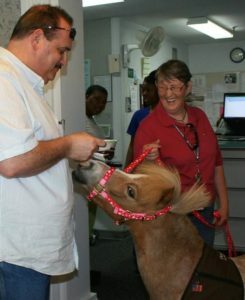 One year I crocheted 22 small horses for Lily to give to patients. Another year, I made pillowcases. Last year, we commissioned someone to make miniature polymer horses in Lily’s likeness. Twice, Lily has met catatonic children and we were told there was no point in visiting as they’d not responded to family, nurses or doctors. Well, they reacted to Lily. On the second visit, the doctors were in the room to observe and videotape the meeting. And again, a patient they could not reach, Lily was able to. Lily instinctively knows what to do and how to interact with little input from me. I drive Lily to work and hold the lead rope, Lily does the rest! If a client is afraid and a parent attempts to force an interaction, Lily will back out of the room to relieve the client’s fear. In our six years we’ve been privileged to see some very amazing things happen during our visits. Someone described our visits as magical and I couldn’t be more proud that someone views our visitations as such. I’m 69 and for a couple of years my speech has declined and recently found out I have a rare form of ALS. I’ve given up speaking in pubic because the disease damaged the portion of the brain that controls emotions. I no longer speak on the phone. 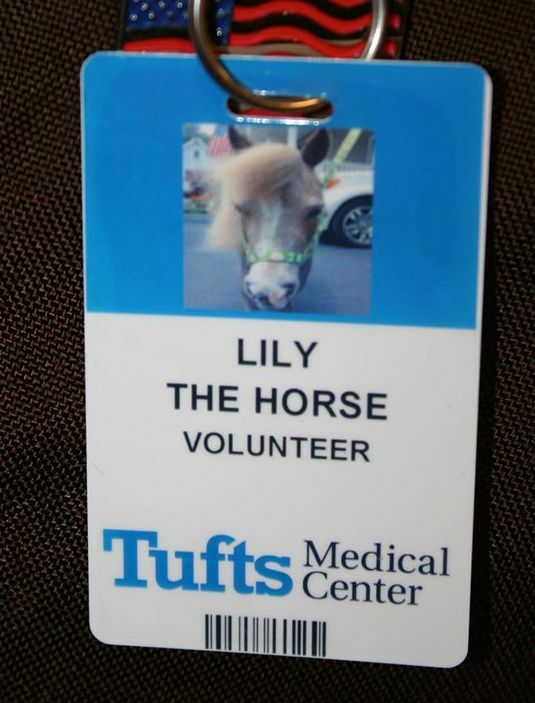 But Lily and her therapy work make me forge ahead. Jack observes that when we’re working I seem to forget that I sound drunk and I’m relaxed and chatty. I often think that Lily is doing reverse pet therapy with me. I’m blessed to have found her. Blessed to have realized her potential for therapy work. Blessed she’s become my own daily therapy. Posted in Therapy and tagged Marsha Craig, mini horse therapy. 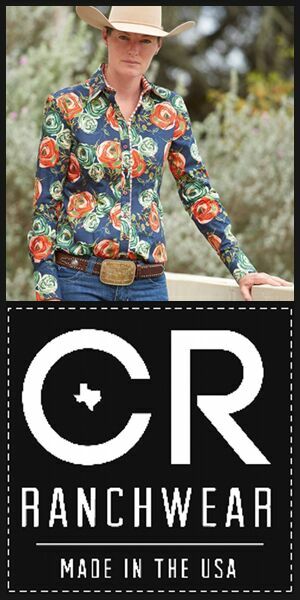 I was so touched by this article and the courage of Marsha Craig. I am very interested to email with Marsha about how she recognized Lily’s potential. I am a PATH certified Equine Specialist in Mental Health and Learning and would like to explore the possibilitiey of a similar program here in Georgia.